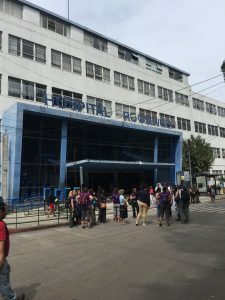 Today the UW group toured the Hospital Roosevelt in Guatemala City. The group was subdivided into two, and each tour viewed a different area of the hospital. My visit was led by two of the hospital’s nurses, and we observed the emergency room, holding areas, operating rooms and the ICU. 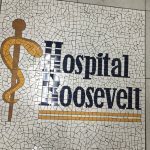 Some history facts, the Hospital Roosevelt was built in the 1940’s and is named after President Roosevelt, the healthcare facility serves people from the capital city and the entire country. Patients are referred to the hospital, and the care is free but items such as IV fluids, blood products, and medication are not free, and the patient or their family/friends need to purchase items required for the care which can be difficult for a poor, ill person. The hospital tour felt like stepping back in time, in the general areas the equipment was very old looking, the holding areas were wards which did not allow privacy for the patients. When touring the ICU, I was pleasantly surprised to see updated equipment, the ICU monitors were modernized, they used the same feeding pumps as my ICU, and the ventilators appeared to be very new. During the hospital tour, there were no overly distressed patients, everyone appeared to be comfortable, the group of patients waiting for orthopedic surgery all seem to be tolerating their injuries well. I thought there would be a lot of moaning and distressed patients due to pain, as it is difficult for a patient to afford pain medications. Today’s clinic was a bit surreal, we arrive at this coastal village via boat and disembark on the beach. 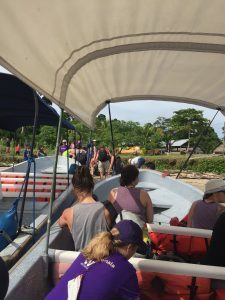 The scenery was picturesque, the air was breezy warm, exotic birds fluttered close by skimming the water to retrieve small fish in their beaks, and children in the water, cheerily playing but very focused on the newcomers. The medical team is in high spirits, I cannot tell if this joyful mood is due to the beautiful surroundings or because this will be our last clinic for this trip? I am cheerful for both. It was my teams turn today to complete a community windshield survey for a village, I am looking forward to this experience for everyone before has enjoyed their village tours. The village health promoter helping us today is Miguel. We started our journey from today’s clinic area and traveled by foot through the village and learning about what the community resources are. 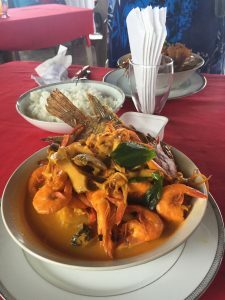 We learn of a couple of their income resources, they dry smelt fish caught at the beach and then dry the small fish on large black mats, and package them for sale, a second income comes from selling charcoal, the process for this is burning wood covered by soil which then produces the charcoal for sale. 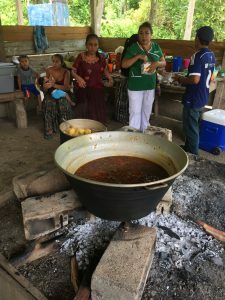 The village includes two churches, one Catholic and one Evangelist, a large school with three classrooms, a large playfield for soccer, a small tienda (store) which holds food, household products, and some medicine. I am surprised to see antibiotics for sale at the tienda. The homes are all surrounded by fences constructed of barbwire, and the homes vary from traditional materials of wood and palm roofing to concrete structures. One house had a satellite dish which was uncommon. 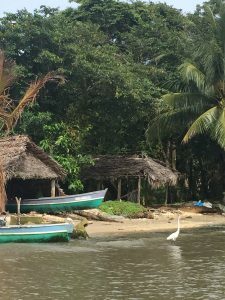 The transportation modes include, boats, walking, bicycle, motorcycle for the villages and the finca (estate) owners have vehicles. For employment many villagers need to leave for two-week periods, to work at finca’s to provide income for their families. 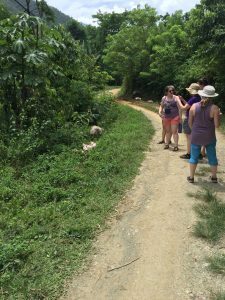 Today’s village tour indeed provided insight into the life of a Guatemala villager and understanding of the struggles they face. The community resources for income are not enough to sustain families, and family members needed to travel for additional income which takes them away from their loved ones for up to two-week periods. 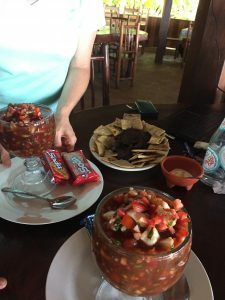 We learned that the local school teaches in Spanish and not the traditional language of Quiche, this method could potentially affect the customary native tongue, they could lose this unique language. Starting today is difficult for we stayed in the village overnight due to the length of time required to reach this area, yesterday we had a clinic for the Semanzana village people who travel to Chinachabilchoch to be seen. 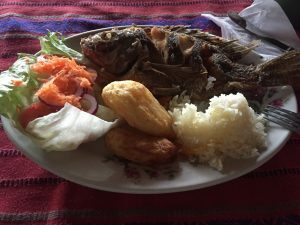 Today we will be seeing the Chinachabilchoch villagers and then going to our Paraiso Hotel. Staying in the village overnight was challenging due to the lack of comforts after working a long hot day. A makeshift shower system was placed in a building for the teams use, but very few used it due to lighting and privacy issues. The latrine was an outdoor facility used by 20 or more people which did not stay clean. 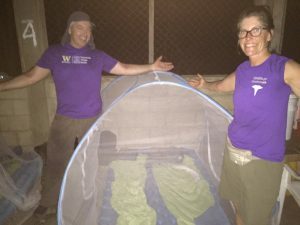 We set-up our sleeping quarters in the same building as our clinic. 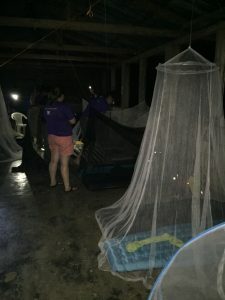 We prepared for this overnight stay with air mattresses and mosquito nets which were arranged in three different areas of the building. Everyone was tired after our work day but falling to sleep was difficult due to the hot nighttime air and the rustling/noisiness of the other cohorts. Everyone worked hard today and even though we woke this morning with little sleep and felt at our worst, no one showed any signs of frustration towards the patients or each other during the clinic. I was very proud of our group today and glad to see everyone overcoming the difficult challenge placed upon them with such professionalism. Everyone worked with a focus today as we process 90-100 patients, we were motivated to get back to the hotel for some comfort and relaxation. 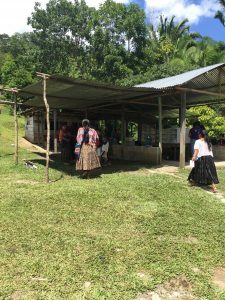 Today our village clinic was in Esperanza Tunico, people were already waiting for as we arrived to get set up for the workday. In total for the day, we saw about sixty patients comprising mostly women and children, for the men are at work during our clinics which run from 9 a.m. to about 2 p.m. For this clinic I worked in the vital sign station, the station rapidly became chaotic as patients did not understand the flow process and the language barrier provided additional challenges. It did not take long to come up with an organized process which improved the patient flow, this is where I noticed my passed charge nursing experience came into action. 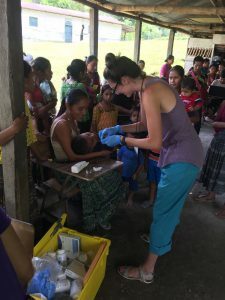 Mostly the patient’s vital signs were stable, as this group of people are seen every six months by the GVH team and regularly by the local health promoter. The GVH records the data for each patient seen, and we noticed very few new clients at this clinic. Today I was able to work on my Spanish skills to communicate greetings, my title and what my station was providing. It was easy to feel motivated to help this population for the patients were very pleasant, cooperative and eager to seek help. I noticed the patients were well dressed, I felt the people were in their best clothing to come to the clinic, they show pride in the cultural attire. During the chaotic day, I never once viewed a client who was angry, upset, or pushy, everyone displayed a pleasant disposition. I wondered if this clinic was really helping the people of Esperanza Tunico as it felt like we were band-aid healing. I learned that the local health promoters follow-up with patients care, which helped me think that we were making a difference. 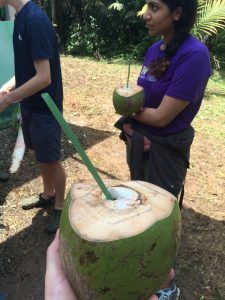 The most difficult challenge for this clinic was dealing with the hot, humid weather and remembering to drink plenty of fluids. Drinking warm water was not refreshing but adding flavoring to the water, like a GU electrolyte helped me to take in needed fluids. Today we traveled by bus from Guatemala City to the Santiago training center (2hrs) which is owned by Jennifer Hoock, our trip manager from the Guatemala Village Health (GVH) group. Jennifer does not live at the center, she has a local family living at the center which manages it. 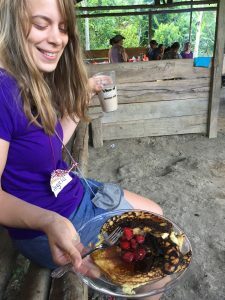 The center has a main house, which is in continuous improvements, we learned there were new kitchen cupboards placed and a new tile flooring in the last year. A new range stove and refrigerator arrived today at the center during our visit. The center had an example of a functional out-house toilet which is built in the rural villages. There were water purification systems (ECO system), which consists of a ceramic clay pot (clay is mixed with wood shavings and baked, this curing process turns the wood shavings into carbon, then the clay pot is painted with silver) housed by a plastic pale. Water is poured into the clay pot, and purified water is removed from the bottom via a spigot. There is also a carpenter training area too. 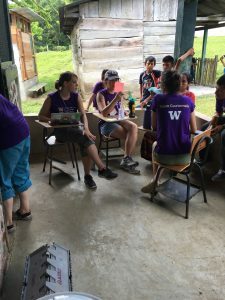 At the training center the UW group, the GVH group, and the Guatemalans unpacked the supplies that were transferred from Seattle, WA to Guatemala. The center houses medical supplies which are used during the clinic visits in the rural villages. The travel clinic supplies were stocked and sorted by systems, i.e., GI, Pulmonary, Cardiac by the three groups. 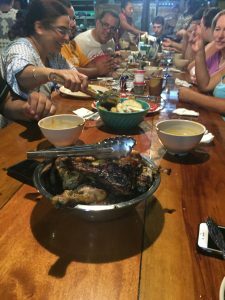 This process allowed the groups to become acquainted with one another. We then set up for a mock clinic which turned into a regular clinic, as locals turned up for medical treatments. 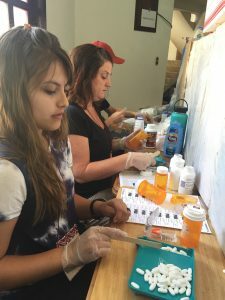 The clinic visit started with registration, then vital signs, triage, group charlas, finally to see the doctor and/or pharmacy. It was great to treat the locals, about 43 patients were examined, this allowed a good practice for the planned village clinics. 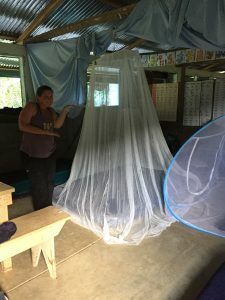 During this training session, I was a triage nurse, a Spanish interpreter was needed to complete the patient assessment, and data was entered into the Electronic Medical Record (EMR) and on a papelitos (little papers). The patient moved through the clinic with the help of a runner. During the day’s activities, I learned how important it is to have a system in place to run a clinic efficiently. It takes many hands to prepare for a mobile medical clinic.